Yet again this year the Punk Glam Princess has gotten creative and mum gets to do all the sewing! She's going as Alice from "Madness Returns" a character from a video game. 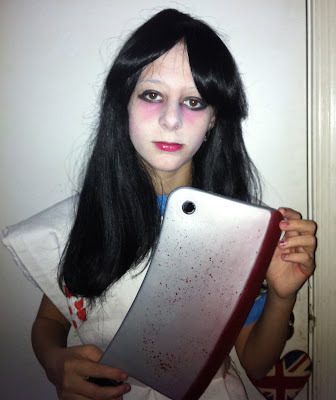 Pretty creepy and gory -- that's my girl, always in the "spirit" of Halloween! Yeah we even found a bloody hatchet, and I have the perfect wig for the outfit. Even though it can be a chore to make her costumes I do admit I quite like using my creative juices figuring out the best way to make it. Especially when it can be quite cold here on Halloween so she might have to bundle under the costume. The whole project cost under $20 including the hatchet, ribbon, tulle, calico, striped tights, and the apron fabric. Certainly beats the $60-$80 they wanted for a ready made costume! My costume wound up changing. 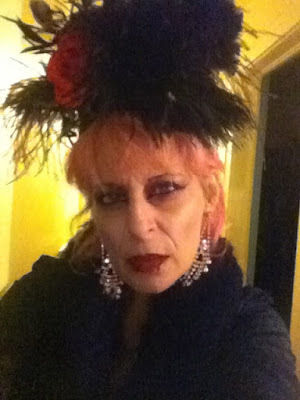 I had this whole Victorian Vampire Queen theme, but got too overheated and the headpiece wouldn't stay on. So I went in the complete opposite direction and became a modern Vampire Queen. I made the headpiece out of bits and pieces, vintage feathers, a raven, a rose hair clip, all stuff I had in my craft stash. All done on top of this massive crown. It was a little top heavy, but fun to wear! The PGK was a crow man, with a pinstriped suit and a huge crow beak! Since it was a school night, we didn't go crazy with decor outside -- needless to say the storm would've destroyed everything anyway -- so we went simple. And it was an early night as the kids had school.